James Leonard Cooper, beloved Husband, Father and Grandfather, passed away on September 17, 2010, at Mount Carmel East Hospital, Columbus, Ohio. A graduate of Ashland High School, James worked in Ashland at William Garber Company as a young man, and brought his talents with graphic design and photo development to Cooper Color Graphics, a commercial printing company in Columbus, Ohio, that he owned with his son, James. The youngest of seven siblings, James cherished his family; with his beloved wife, Lucy, he raised three children and nursed them through the polio epidemic of the early 1950's. James had a great love of flowers, especially roses and begonias, and took great delight in raising bonsai. He was also an accomplished artist who worked in oils and watercolors. James was a 32nd degree Mason. 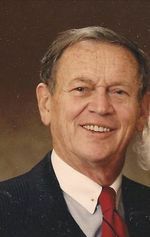 James is predeceased by his wife of fifty-six years, Rosemary Lucille (Boals); their daughter, Cynthia Sue Cooper, and their son, James Steven Cooper. James is survived by his daughter, Pamela Kay Brown and son-in-law, Thomas L. Brown, his daughter-in-law, Kathleen M. Cooper, and his grandchildren: Maggie G. Cooper (Dr. Stephen Tooth), Anne Colleen Cooper and Shane James Cooper, as well as many nieces and nephews. Services will be held at Heyl's Funeral Home, 227 Broad St.,Ashland, on Thursday, September 23, at 3:00 P.M. with Pastor Dan Bilkert officiating. Calling hours will begin at 1:00 P.M. Burial will follow at Chestnut Grove Cemetery, Ashland.